Click on small images for more pictures! This is an outstanding antique Rookwood art pottery ewer vase with hand painted floral artwork by the artist Sara Sax. Produced in 1899, fully marked, along with Sara Sax's impressed initial signature. "#611" and size mark "D". It also has its original store label from Burley & Company of Chicago where the vase was originally purchased. Vase is done in the 'standard' high 'mirror' gloss glaze with beautiful yellow and orange flowers, green and yellow leaves and stems. It is 8-3/4" tall overall. It is in very nice condition with no chips, chiggers, cracks or repairs. There is fine crazing as expected. The glaze is still in remarkable condition considering its age although close inspection and in just the right lighting one can see some lite spotting on the lighter glazed bottom areas. This is common for pieces from this period. Due to the mirrored glaze the pictures show some lighting reflections. 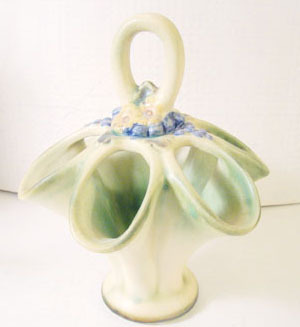 STUNNING Early Julius Dressler Art Nouveau Pottery Wall Pocket Vase. This is an amazing antique art pottery wall pocket vase comes from a fine estate. Produced in Austria, in Bela or Biela Bohemia by the Julius Dressler Pottery works, circa early 1900's. Marked "Austria"on back. 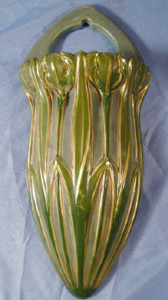 Known as "Jugendstil" or "Secessionist" ware this wall vase has a matte green base with gloss glazed majestically uniformed, successive tulips across the front. Sculpted handle above. Hand painted gold gilt accent. Nice size measuring, 12-1/4" Height, 5-1/2" Width, 2-1/4" Depth. It is of good quality and rare form. It is in very nice condition with no chips, cracks, hairlines, or repairs. The coloring is still vibrant and the hand-painted gilting still has a nice sheen. 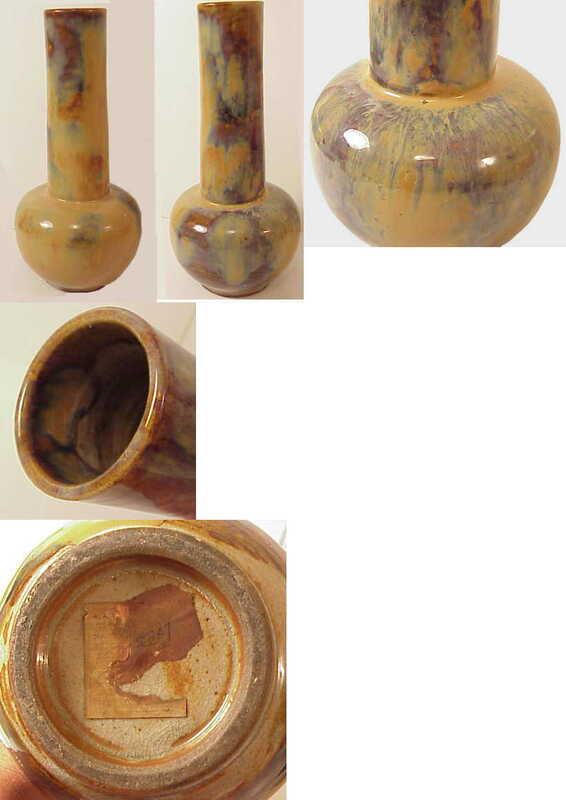 Take a look at the pictures for a better understanding of this impressive wall pocket vase. Petucco & Tolio Monotype Painting Italy 50s Gambone Bertoia Modernist Art Tray! 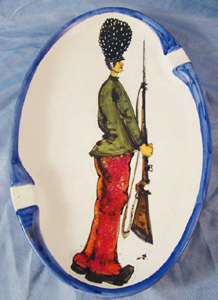 This is a rare one of a kind monotype painting on ceramic ashtray/tray by Petucco & Tolio. The company was founded in 1945 in the province of Nove, Italy by Giovanni Petucco and Andrea Tolio. Their ceramics are highly collectible due in part to their modernist designs. Approx 13" x 8" x 1-1/2". The artwork is quite unique due to the artistic process and the rarity. If your not familiar with a monotype, it was a type of printmaking. Usually a painting was done on a copper, zinc or glass etching plate and then it would be transferred onto the surface where the artist wished the work to appear. Most monotype's were done on paper or canvas. In this case the work was transfered to the ceramic tray and then the painting was embellished and hand painted on the rim to finish the piece for display. Close up inspection shows the slight irregular line around the figure, left by the plate. The artwork on the front is signed SL . On the back it is stamped NOVE P.T. ITALY . It is also marked J.W. CO. and numbered: 32/36-4. This rare piece would make a fabulous addition to any mid-century, modernist, Gambone/Bertoia decor! RARE Rookwood Art Pottery 1922 Acorn & Leaf Match Holder HTF Pink Glaze! Early, hard-to-find, Rookwood Art Pottery match holder. Decorated with acorns and leaves. Unusual mauve/pink glaze. Bottom marked with logo, date mark- 1922., and shape number - 2023. Match holder is 2 1/2" tall and 2 1/2" wide. Very nice condition. No chips, chiggers, cracks, or repairs. Does have a couple of tiny, pin sized glaze pops on the one side. These are common occurrences in the production of pottery, and do not detract from its overall appeal and are noted for accuracy. Czech Teplitz Art Deco AMPHORA 30s Pottery Basket Vase Majolica City Stars Rare! Czechoslovakia Amphora ware double spout basket vase. 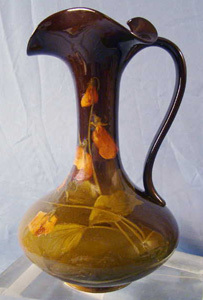 Made sometime between 1918-1939 by Amphora Works, Riessner and bears their oval mark. Most of the works from this period feature flowers, birds, butterflies, etc. but this unusual piece features a city with sky line and stars. Vivid high gloss glaze, ornate hand work details. Interior done in a green with high gloss glaze also. It is in very nice condition overall with no chips, chiggers, cracks, hairlines or repairs. There is some rubs to the glaze/coloring here and there. It measures 7-3/4" in length, 5" wide, and 6" tall overall. A stunning, hard to find, piece for your collection. Rare Designer Mid Century Modern Italian Bowl Face? Mark Gambone Eames era Signd! Totally unique vintage mid-century designer serving bowl. Signed with what appears to be a face with a big nose? Seen this mark several years ago, just can't remember who the designer was. Also has "Made in Italy". Thirteen 1" holes around the exterior shapely, scalloped rim. Candle holder? Yellow and green heavy glaze. Green stenciled under glaze pattern around each hole. Approx. 10-1/4" dia. 3-1/2" height. Heavy ceramic pottery. Piece displays nicely and looks amazing with candles displayed around. Can even use long vegetables like celery, carrots, etc to make a totally cool looking veggie display. There is two flakes to the glaze on the exterior rim. No other chips, cracks, chiggers or repairs. RARE Old Sipa Paris French CHARLES KING of HEARTS Decanter Bottle Majolica. Rare vintage majolica liqueur decanter/bottle from an estate. Figural form of Charles King of Hearts. Two heads opposite just like the playing cards. Knife in hand behind head's. Criss cross pattern on the back to simulate the back of the card. Cork stoppered crown on top. 10-1/2" height. Hand inscribed markings on base, "Sipa, Paris". Marked 75 L on the back side. Majolica glaze over heavy ceramic, inside is also finished in the teal/green glaze. Bottle is complete, in very nice condition with no chips, cracks or repairs. An outstanding, unique piece for a collection. RARE Pair Taisho Period MORIAGE 10" Vases HP Transfer BETSY ROSS Flag WASHINGTON. This is a unique, hard to find set of matching vases from an orientalist collector's estate. Gorgeous moriage work over a bright green background. Two sided (front and back) oval reserves. With the one reserve featuring a hand painted lakeside scene at sunset with a swimming swan. The reverse's has a unique seldom seen transfer in the reserve of a colonial home setting with Betsy Ross working on the American Flag and George Washington looking on. To find one piece featuring moriage work from this era with a US patriotic theme is hard to do, to find two is extremely rare! Each is marked under glaze on the base in red with the circular "Hand Paint, Made in Japan" around double diamonds with "TT" in center, (Takito). Produced around the Taisho to early Showa period. Takito was known more for its lusterware with the moriage additions then works like these. Made especially for the export market. Each is 10" in height. They are in very nice condition overall. No chips, cracks, or repairs. There is lite crazing from age. The applied moriage is intact. The work is amazing. There is lite wear to the transfers of the colonial scene's. Not real notable, but close inspection does show some rubs, and one having a lite scratch line on the side. The hand painted scenes look beautiful. There is a small glaze skip of the green on one. A small circular shadow ring on the side in the green. These are minor manufacturing issues that is to be expected in this type of wares. They were pretty dingy/dusty inside, I've gently rinsed them out but they could use a more thorough cleaning since the white high glaze is not as bright. These would be a wonderful addition to any collection. This is an stunning vintage Japanese vase from an estate.. 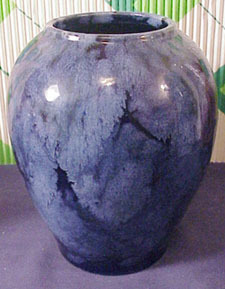 The vase is done in a beautiful deep cobalt blue glaze with raised moriage decoration. It has foo dog handle like decorations on the side. It is marked on the base with the Japanese numeral 3 (Pinyin: san) and numeral 5 (Pinyin: wu). The vase is of nice size measuring approx. 9-1/2" tall, 5" across the rim. The vase is in very nice condition with no chips, cracks, chiggers or repairs. The moriage is fully intact. The gold handpainted gilting along the edge of the rim has pretty much worn away from use. Take a look at the pictures. 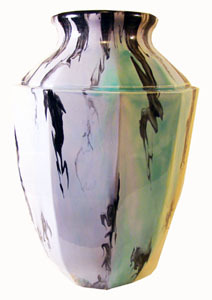 Its a beautiful vase that would be a gorgeous addition to any oriental decor or collection. 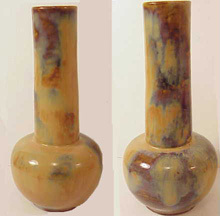 Large unique antique vase 17" in height. 6-3/4" across the rim. Excellant condition no damage or repairs. There are a few pin sized glaze pops. Unmarked. I'm doing some research now to identify this unique glazing. For some reason I'm thinking European or possibly Asian origins. Looks quite impressive on display. Size allows it to be used for an umbrella or cane holder in an entry way. 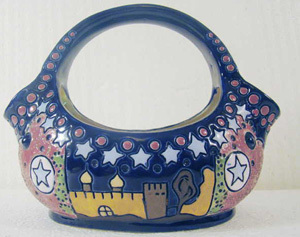 EVA ZEISEL Majolica Basket SMF Schramberg German Art Outstanding vintage art pottery basket. This stunning piece of comes from the Schramberg Majolika Fabrik pottery factory. 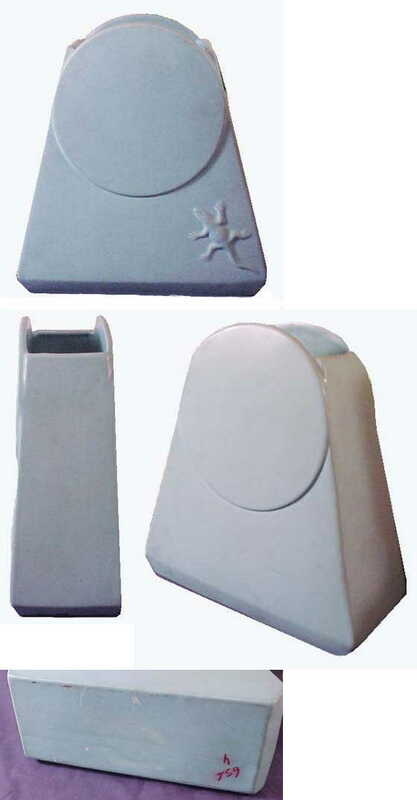 Created by Eva Zeisel, a Hungariean born designer, in the German Bauhaus style. 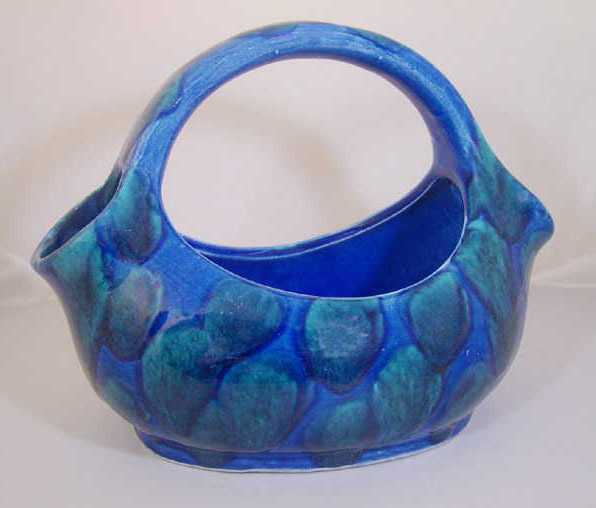 The stunning basket features a unique form, gorgeous cobalt and green with oval pattern, high gloss glaze. It has the SMF banner, Shramberg Germany ink stamp mark along with an empressed 8011. It stands 5-1/2" tall 4-3/4" deep and 7-1/4" long. Very modernistic for its time. It is in very nice condition, no chips, cracks, hairlines or repairs. There is some lite scratches to the glaze on the one side, thats not noticible upon normal viewing. Looks stunning on display. Perfect for serving sauces or gravies too. Please note: the white spots in the pictures are glare from the lighting. HTF Vintage Andrea by Sadek Doberman Pinscher Pedigree Dog Porcelain Figurine 8". 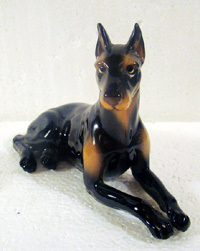 Stunning vintage Doberman Pinscher figurine, who's fresh from an estate and in need of a new home. Nice size, measuring 8" in length and 5-1/4" tall. Original Andrea, by Sadek foil label on the base. Made in Japan. Realistically done, mirrored glaze. He is in very nice condition with no chips, chiggers, cracks or repairs. He would make a lovely addition to any collection. Mid Century Rosenthal Netter Italy Danish Modern Eames Era Cubist Dish Ashtray! 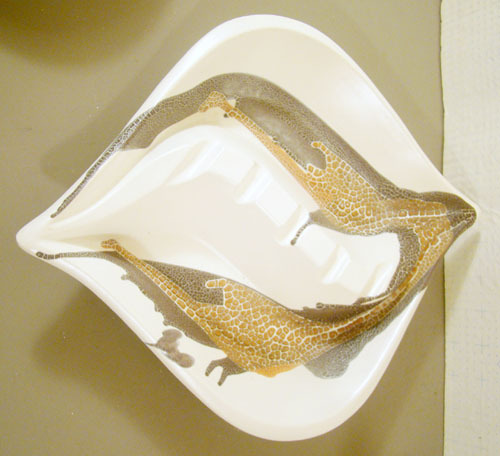 This amazing mid-century modern ashtray was made by Rosenthal Netter. It has its original "Created in Italy for Rosenthal Netter, label on the bottom and is impressed "Italy" also. 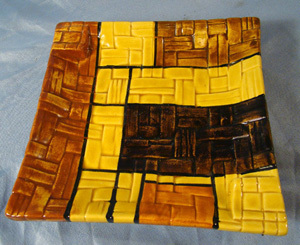 Woven cubist design in black, brown, golden yellow, and sienna glaze. Perfect style and coloring for a Danish Modern decor. Raised rests on two of the corners are hard to note, so it could be easily be used as a mint dish. 6-1/2" x 6-1/2" x 1-1/4". Very nice condition. No chips, cracks, hairlines, discoloring or repairs. Vintage FITZ & FLOYD NIB China Set Service for 4 HATTORI Cinnabar 23 k Gold NICE! Fresh from an estate, a beautiful complete set, service for four, of vintage Fitz & Floyd, fine porcelain dishes. The pattern is called "Hattori" and service is glossy black porcelain with a lovely cinnabar rim and 23 karat gold trim. Set is in excellent condition, unused. Service is still packed in its original boxes, pieces are still sealed in bags. I opened the boxes to get sizes and for inspection since they have been in storage for many years. This pattern was issued in 1979. Pieces are marked on the back " "Hattori" Fitz and Floyd, Inc. © MCMLXXIX, FF. Not often you get a chance to purchase such a stunning set of fine quality dinnerware that is over 35 years old and still as new in the box. Service includes: 4- Dinner Plates, 10-1/4" dia. 4 - Salad Plates, 6-1/2" dia. 4 - Bread and Butter Plates , 6-3/4" dia. 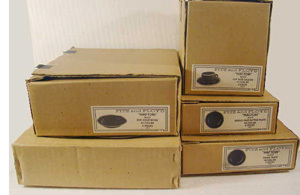 4 - Rim Soup Bowls, 9-1/4" dia. 4 - Cups, 4 - Saucers, 5-3/8" dia. Fabulous vintage mid-century modern Duck bowl, candle holder,candy dish. Heavy art pottery. Marked on the bottom 3439, Bo Fajans Sweden, which was the mark of the famous Swedish company BOBERGS FAJANSFABRIK. Designed by Maggi Wibom. 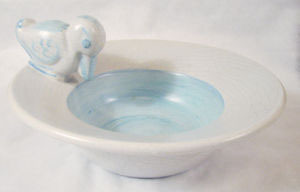 White glaze with hand-painted blue center and details on the duck. Special technique was done with the glaze giving it the appearance of blue crazed lines overall. It is in excellant condition with no chips, cracks, chiggers or repairs. It measures 8" across and 2-3/8" tall on the bowl part and 4" tall overall. Bo Fajans closed down back in 1967 and pieces are getting hard to find here in the states and such a unique piece by Maggi Wibom is even harder to come across. A fantastic piece to add to your collection or decor. Stunning Vintage Josef Originals Doberman Pinscher Dog Figurine Japan VHTF. 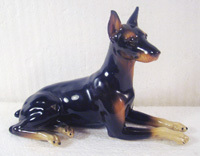 Beautiful, hard to find, vintage Doberman Pinscher figurine, who's fresh from an estate and in need of a new home. Original "Josef Originals, Japan" foil label on the base. Realistically done, with a mirrored glaze. He measures 5-1/2" in length and 3-5/8" tall. He is in very nice condition with no chips, chiggers, cracks or repairs. He would make a lovely addition to any collection. This antique porcelain bud or "spill" vase was made in Czechoslovakia in the 1920s, to early 1930s. From the front it looks like a parrot, the side maybe a song bird? It is in very nice condition with no chips, cracks, hairlines or repairs. Triple holes in the stump base. Beautiful coloring . Red circular ink stamp and #18 on the base.4-5/8" tall, 4-1/4" wide, Nice addition to a collection. 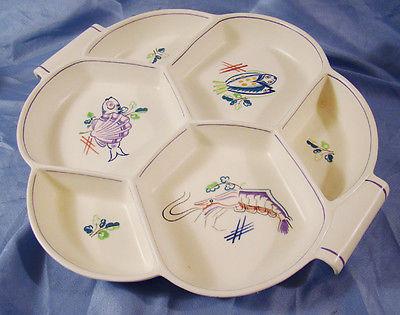 Mid Century POOLE Pottery E/KUA Seafood Sectional Hors D'Oevres Tray Gwen Haskin. This is a lovely vintage mid century sectional serving dish. 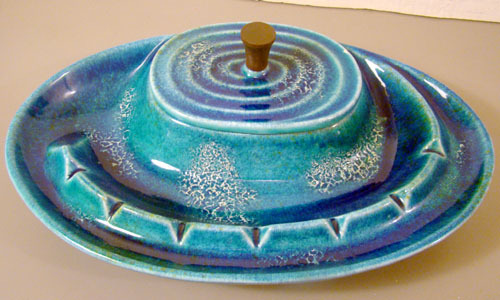 Produced at Poole Pottery in England, and features the artistic work of Gwen Haskins. Perfect for serving seafood tidbits, hors d'oevres, with its handpainted motif of fish, foliage, shells, lobster. Double wave curled handles. Creamy glaze with lavender accent. Very nice condition with no marks, stains, chips, cracks or repairs. It has Gwen's artist mark and the E/KUA pattern mark along with the factory mark used from 1955-1959. It measures 12-1/4" across 13-1/2" across the handles, 1-1/4" depth. Outstanding vintage mid-century modern large tray like ashtray. Abstact, impresstionist, hand painted under glaze. By Petucco & Tolio, The company was founded in 1945 in the province of Nove, Italy by Giovanni Petucco and Andrea Tolio. 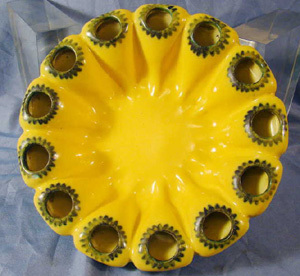 Their ceramics are highly collectible due in part to their modernist designs. 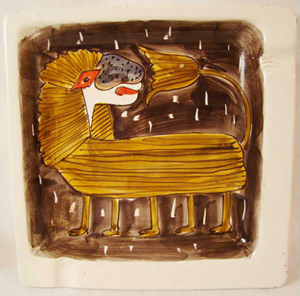 It features a five legged Lion, (my best guess) with brown background and symbolized raindrops. On the back, impressed mark, for Petucco & Tolio. Painted mark underglaze = 1x/125-A. Heavy ceramic, nice size, measuring 9-1/4" x 9-1/8" x 1", and works well as a catch all tray for the entryway or dresser, or add a hanger and display on the wall. It does have some signs of age that are common in vintage ceramics of this nature, but it still looks great on display and would work well in a mid-century modern decor. There is no major damage like cracks or repairs. The artwork is still vivid and nice. There is some crazing on the heavy enameled white area, some small flakes and rubs along the outer edge and on the raised rim on the base. This rare piece would make a fabulous addition to any mid-century, modernist, Gambone/Raymor decor! 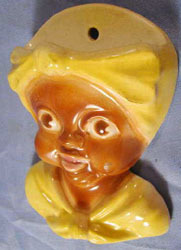 This is an original vintage 1943 Golliwog Mammy in Scarf wall match holder/safe. Produced by the Coventry Ware Pottery company, #5601A. Marked on the back. This was found in an estate several years ago and was still hanging on the wall with stick matches inside, next to the old gas stove! She is in very nice condition with no chips, chiggers, cracks or repairs. The coloring is vivid and the high gloss glaze still has a nice sheen. 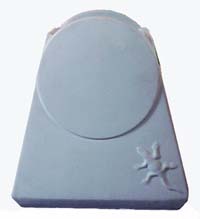 The pottery wall pocket measures 5" tall, 3-1/4" wide, 1-3/4" deep. It is dated by the note wrote on the back in " from Marie Holt 1943". A rare find in an old original piece of Black Americana. Bella Casa by Ganz DAISY Sgnd Susan Paley Lady Figural Vase ~ RARE ~Retired This tall artistic lady vase is the creation of Susan Paley and is a retired work of art. Her name is "Daisy". She is 10-3/4" tall. Opening of the vase is approx. 3" in dia. She is in very nice condition with no chips, chiggers, cracks or repairs. Vivid coloring, unique, quite impressive. Hand painted, no two are exactly alike. Signed on the base, "Belle Casa, © Susan Paley, By Ganz. She has never been used. STUNNING Art Deco Hungarian HEREND Porcelain 7" Madonna w/Child Figurine! Beautiful Hungarian porcelain Madonna with Child figurine from an estate. Handpainted, fine quality, from the Herend Porcelain Manufactory, located in the town of Herend, Hungary. 7" tall. Very nice condition with no chips, chiggers, cracks or repairs. Vintage Orchids of Hawaii Tiki Bar Mug Pedestal Base HTF Hawaiian Drink God Mask! 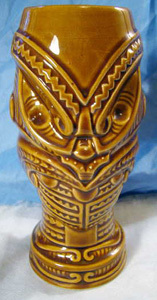 Nice vintage 1950's Orchids of Hawaii fierce face tiki mug. Hard to find pedistal base. Heavy ceramic. Yellow glaze. Excellant condition. No chips, chiggers, cracks or repairs. Lite age crazing as expected. Marked "Orchids of Hawaii, R-1, Japan". 7-1/2" tall. Great addition to the Tiki Bar! Vintage Orchids of Hawaii Tiki Bar Mug Pedestal Base HTF Hawaiian Drink God Mask! 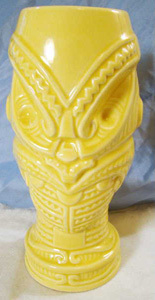 Nice vintage 1950's Orchids of Hawaii fierce face tiki mug. Hard to find pedistal base style. Heavy ceramic. Brown glaze. Excellant condition. No chips, chiggers, cracks or repairs. Lite age crazing as expected. Marked "Orchids of Hawaii, R-1, Japan". 7-1/2" tall. Great addition to the Tiki Bar! 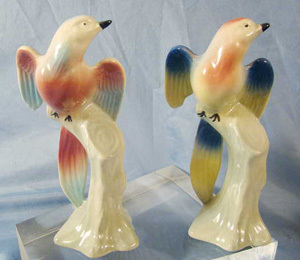 Vintage Pair Set of Royal Copley Swallow Bird Figurines Spaulding China Windsor. An amazing set of vintage Royal Copley bird on tree stump figurines. Excellent condition with no chips, cracks or repairs. Each is 6-3/4" tall. Gorgeous coloring and they display beautifully. 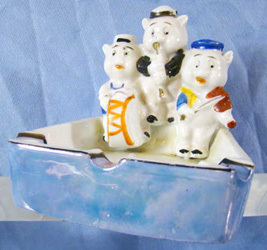 Rare 30s Walt Disney "Three Little Pigs" SILLY SYMPHONY HP Bisque Japan Ashtray! Featuring the Fifer Pig, Fiddler Pig and Practical Pig, from the Silly Symphony cartoon, in which Disney's first rendition of the pigs premiered. Made of luster glaze and hand-painted bisque china. Ashtray is marked © Walt Disney, and Made in Japan on the bottom. Another marking under the paint on the back of the center pig, just can't make it out. This ashtray is in excellent condition overall. No breaks, chips or repairs. Lite wear the the handpainting on the figures. No staining or signs of use. Displays nicely. It measures 4" x 3" x 3-1/4". 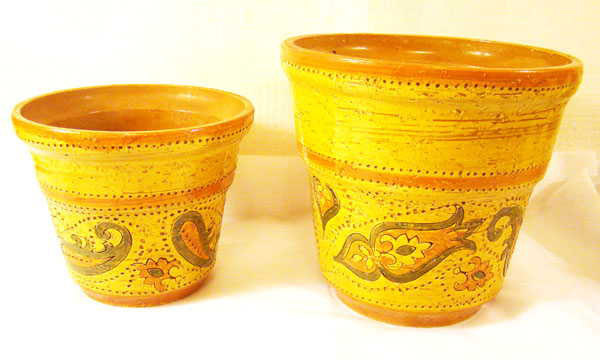 2 - ROSENTHAL NETTER ITALIAN POTTERY BITOSSI ITALY MOD Set of two vintage retro mid-century mod flower pot vases. Produced in Italy by Rosenthal Netter. Both are marked on the bottom, with the larger of the two having its original Rosenthal Netter Italy label still in place. The larger one is 6-1/2" tall and 7" across the top, the smaller is 6" x 5". The small one is in excellant condition with no damage or repairs. The larger pot has a chip on the rim side. Take a look this is a a great set! Hard to believe they have stayed together all these years. 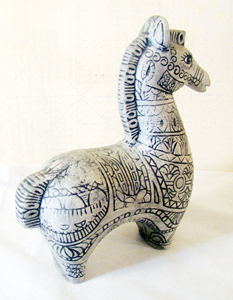 Sgraffito after Bitossi Ceramic Modernist Horse. circa 1950's. Incised design. Hard to find! Excellant condition. Unsigned. 6.5" tall, 5" long. Italian Mid-Century Aldo Londi Modern Studio Ceramic Cigarette Box & Lighter Bitossi Netter Vintage mid-century table lighter and matching cigarette box. Each signed "Italy" with numbers. The lighter is 8" tall overall, and 2-5/8" wide. The box is 8" x 4" x 2". Both are in good condition overall. Lite signs of age or use. Box has tiny flakes, rubs. They don't show as it looks like they were touched up at some point. Lighter will need fluid to operated. Great set for that mid-century modernist decor. 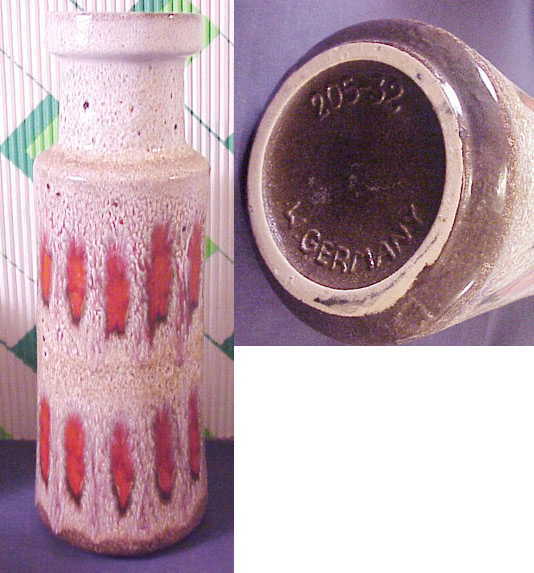 Scarce old Weller Art Pottery Umbrella Vase. 7-1/2" tall. Marked with the ink stamp, Weller Ware with jug and the letter H. Excellant condition. No chips,chiggers, cracks or repairs. It doesn't get better then this if your into Weller Art Pottery. Look around you won't find this vase offered for sale. Very rare. 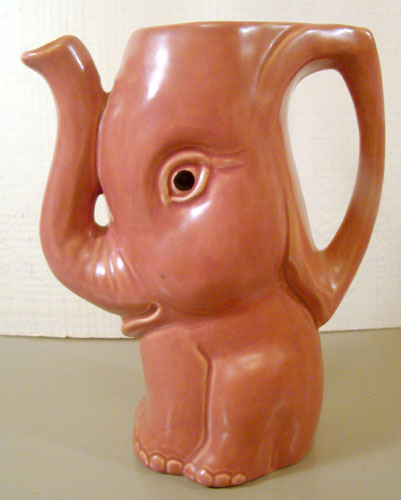 Rare Invento Pottery Elephant Pitcher! Adorable vintage figural pitcher. Mauve pink glaze. Elephants trunk is the spout and a handle on the back side of his head. Ink stamp mark, Invento, Made in England on the bottom. Excellant condition. 9" tall. Not a lot of these around. Vtg Mid Century Modern San Marino Sgraffito Italy Ceramic Fantoni Cubist Vase! Amazing vintage 1960's vase from the village of San Marino, Cemas (Italy). Statuesque, tapered form. Céramique. Stylized hand painted woman, done in the sgraffito technique on the front. Lite charcoal colored irregular vertical lines around the back side. Original Décor Main (hand painted) label on the bottom front. Penciled 8110 Cemas on the bottom. 14-1/4" tall, 3-1/4" x 2-1/4' on the top opening. Base is 4-1/8" x 2-1/2". . Excellant condition. More stunning then the pictures project. MID Century ATomic CERMAR Retro FISH Serving Tray eames! 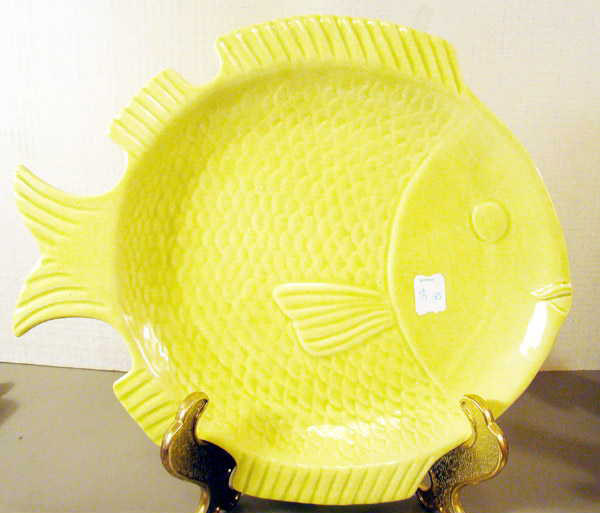 Fun mid-century modern big "Fish" shaped serving tray. Heavy art pottery by Cermar #634. Lemon yellow glaze. Nice large size, 13-1/2" long and 11-3/4" tall and 1-1/4" deep. This was found in storage of a department store (Youngs) that closed a long time ago. It still has its price sticker on the front, $1.00. It is in excellant other then there is a shallow chip on the bottom edge of one of the fins. Great piece to serve on. FABULOUS 1950'S ALVINO BAGNI FOR BITOSSI, RAYMOR MOD FLOWER BOWL! 12-3/4" long, 6-1/2" wide. 5" tall on the ends. 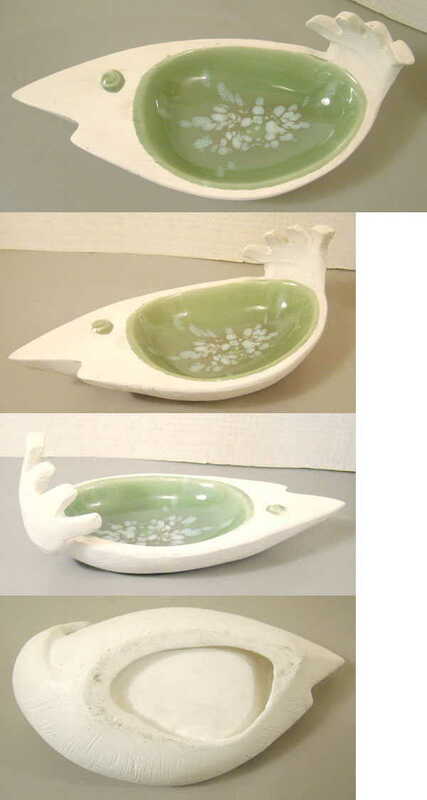 White matte glaze, blue, black and green modernist flowers handpainted underglaze inside Boomerang shape. Excellant condition. A couple of small glaze pops. Flowers are still vivid and bright. Marked on the bottom, and original Raymor import price sticker in place still. 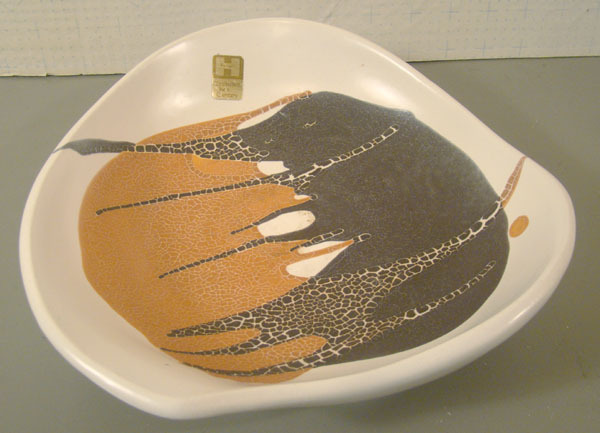 Outstanding 1960's Aldo Londi for Bitossi, Raymor Canoe Bowl. Quality made, heavy ceramic/pottery. 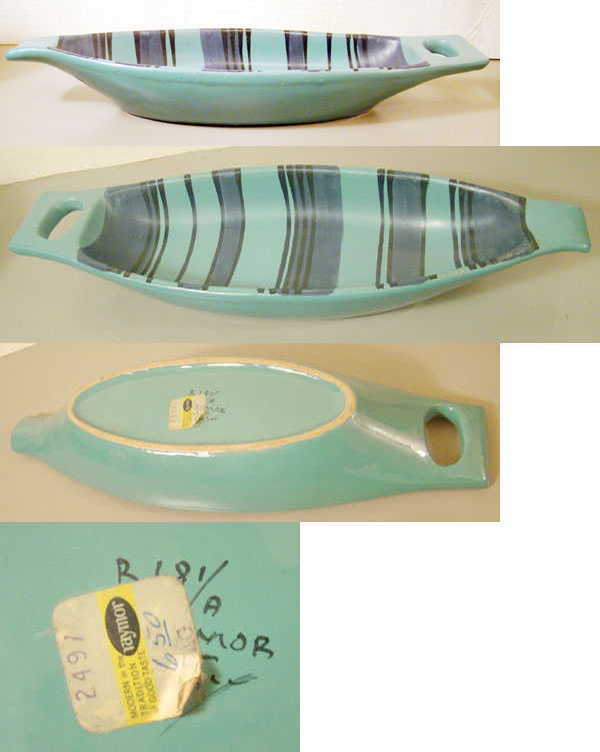 Gorgeous green/blue glaze with black and gray handpainted striped pattern underglaze. Measures 14" long, 4-3/8" wide, and 2" tall overall. Excellant condition. No chips, chiggers or cracks. There is some tiny pin size surface glaze pops on the heavy glazing on the top sides, nothing major or noticable unless a close inspection is done. Original marks and original Raymor label on the base. Displays nicely and would make a nice addition to any mid-century modern decor. Vintage 60's Roth Tiemroth, Norway Studio Pottery Candlestick Holder. 12" long, 2-7/8" across.2-1/2" deep. Hand signed R. Riemroth, 24 on the back. Excellant condition. Deep blue with green and lite blue accent glaze. Modernist cubes and circles impressed pattern. Heavy yellow Scandinavian clay. 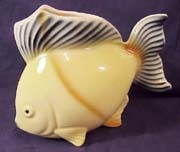 RETRO MID-CENTURY MODERINST FISH ASHTRAY! Unsigned, moderist ashtray. In the shape of a fish with the tail curved up. White matte glaze over texture gives this the appearence of painted wood. Heavy mottled green glaze in the belly along with the eye, adds color. 8-3/4" long, 4" wide, 3-1/2 " tall. No chips, chiggers, cracks or repairs. Large blue art pottery vase with lizard and moon. 12" x 11" x 5". There is a mark on the bottom, an oval circle with a slender round end oval running though it. There is a name inside this? Had some assistants and was told this was Haeger Pottery. Matte teal blue glaze ( simular to Van Briggle) Very nice condition. No damage or repairs. Interesting old piece of art pottery. Michael Andersen Danish Modern HP Art Pottery Vase Beautiful hand painted art pottery vase from the Michael Andersen and Sons Company of Denmark. Marked on the bottom with the impressed triple fish shield as well as the artists initials ES, and Denmark. Excellant condition. 4-3/4" tall. 4" across the vase. Stunning example of danish modern art pottery that would display well in any mid century, eames designer decor. Fulper Large Vase Frothy Brown/Blue Mirrored Flambe This lovely old vase was found stored in an estate. 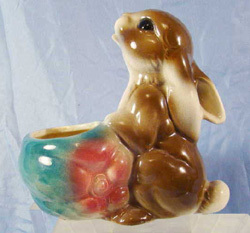 It has a beautiful mirrored frothy browns and blues flambe glaze. It is in excellant condition, with no chips, chiggers, cracks or repairs. It is 10-3/4" tall, and about 5-1/4" across the widest part, 2-1/4" neck. It has two original labels on the bottom, and I have not attemped to remove them to see if there is a mark. I can feel that there is some sort of raised impression, but I don't know if it is a mark or glazing. I had a friend that specializes in pottery take a look at this and his best guess was that it was Fulper, and produced in 1909-1916. Whoever made it, it is old and quite a remarkable piece of art pottery in a seldom found form to add to a collection. Click on the pic. from more images. Stunning vintage 1950's Royal Haeger #2094 EARTHWRAP MODERNIST ashtray. By the talented artist and sculptor Royal Arden Hickman. Superbly executed modernist form displays the Earthwrap glaze brilliantly. Various shades of brown in the unique earthwrap stand out vividly against the creamy white smooth matte glaze. 12-1/4" from tip to tip, 10" across. Marked on the bottom. Excellant condition. Please note there is a chip on the underside of the rim, but it is under glaze and assuming that it was done in production. Fabulous mid-centruy example of Royal Haeger's Earthwrap glaze in this vintage free form bowl. Designed by Arden Hickman. Superbly executed modernist form displays the Earthwarp glaze brilliantly. Bowl measures 9" x 8-1/2" x 2-1/4". Embossed marked Royal Haeger 3171 USA on the bottom with the gold foil glaze tested label, and original gold foil Craftsman for a Century label inside the bowl. 50s Carstens Tonnieshof Mid Century Orange Spot Designer Vase. From the creative peak of West German art pottery comes this extremely attractive Carstens Tonnieshof vase. 12-3/4" tall. 4-1/2" across the base. 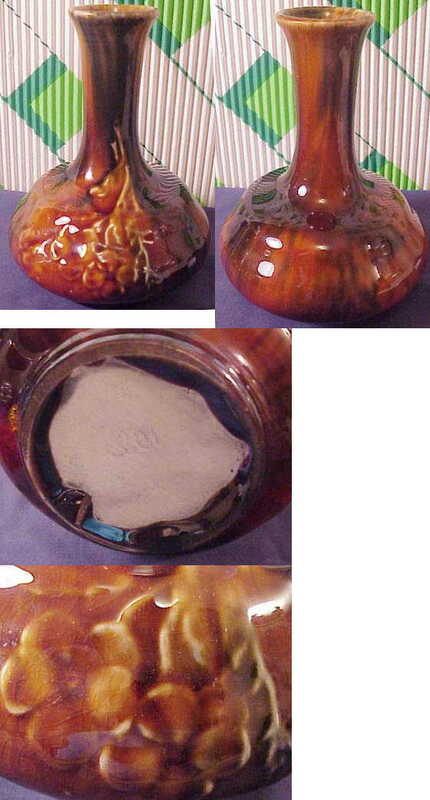 Unique glazing, orange inset pattern on the outside. Deep brown gloss glaze inside. Marked on the bottom 205-32, W, Germany. Very nice condition. 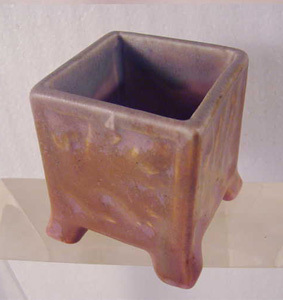 A small chip on the top side, blends well as the pottery color is brown. No other chips, chiggers, cracks or repairs. 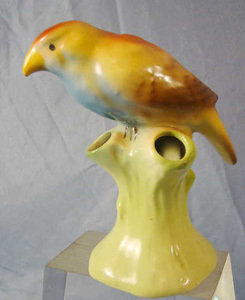 Fabulous example of mid-century German art pottery. 50s Carstens Tonnieshof Mid Century Designer Pitcher Vase ! From the creative peak of West German art pottery comes this extremely attractive Carstens Tonnieshof handled vase. With partial original label on the front. 11-3/4" tall. 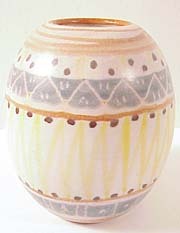 Unique glaze and inset pattern on the outside. Deep brown gloss glaze inside. Marked on the bottom 627-29, W. Germany. Very nice condition. No chips, chiggers, cracks or repairs. 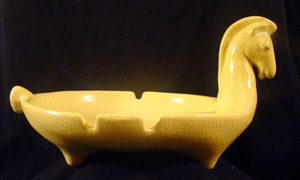 Fabulous example of mid-century German art pottery. 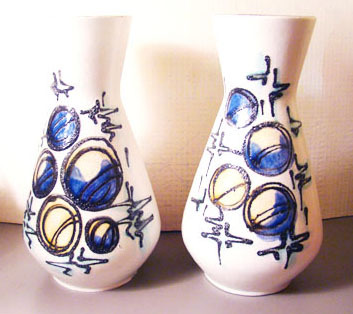 Stunning Pair of matching mid-century Tönnieshof Carstens W. Germany Art Pottery vases. Highly sought after and finding a matching pair is extremely rare! Each is 10" tall, 3-1/2" across the lip and 5" at the widest point. Labels are long gone and each potteries history is not complete. Each is marked on the base "W. Germany 1216-25. They are nicely done and feature a stunning raised modern design with circular orbs and lines with great contrast against the white underglaze. The black lines have a glittery lava like appearance. Excellant condition other then a shallow chip on the bottom rim on one. 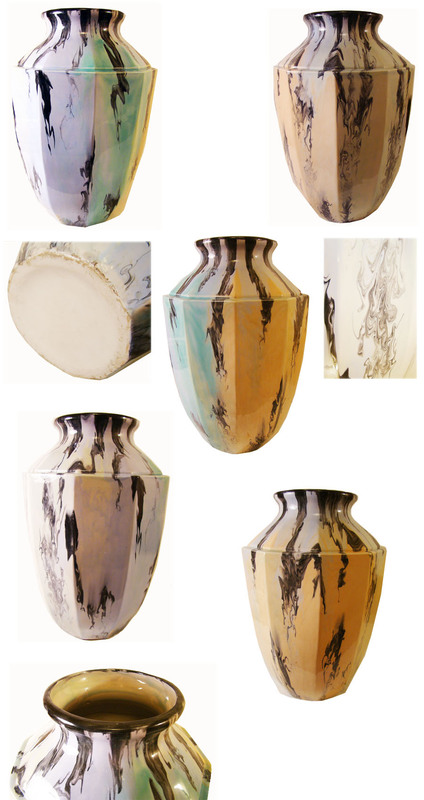 This is the chance to own a very collectable set of mid-20th century art design pottery vases. 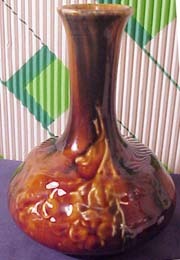 Stunning, original BRUSH MCCOY 1920'S vase. 6-3/4" tall. Fascinating onyx glaze in beautiful blues and black, looking a lot like a crystalline glaze done by other potteries. Heavy stoneware like pottery. No chips, cracks. chiggers or repairs. A couple of tiny pin size glaze pops, as is common on this type of pottery. Normal lite age crazing to the glaze. Unsigned. Beautiful example of art pottery to add to a collection. 50s Carstens Tonnieshof Mid Century Designer Vase! From the creative peak of West German art pottery comes this extremely attractive Carstens Tonnieshof large vase. With its original label. 11-1/4" tall. Unique glaze and inset pattern on the outside. Deep brown gloss glaze inside. Marked on the bottom 1217-29, W, Germany. Very nice condition. No chips, chiggers, cracks or repairs. 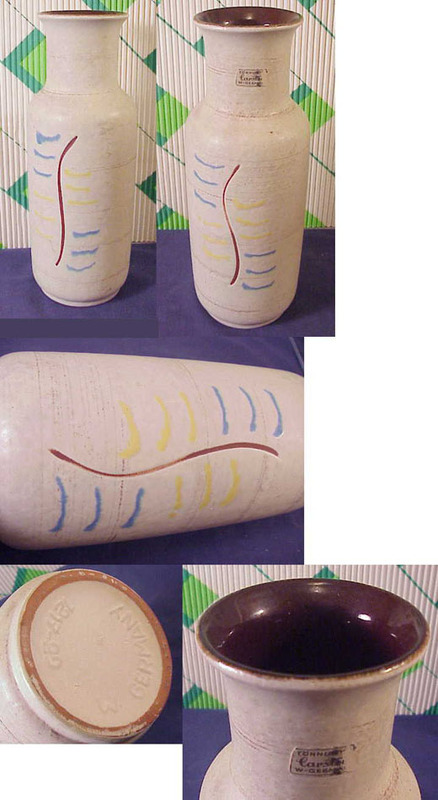 Fabulous example of mid-century German art pottery. CHINESE BLUE FLUPER STYLE FLAMBE VASE! 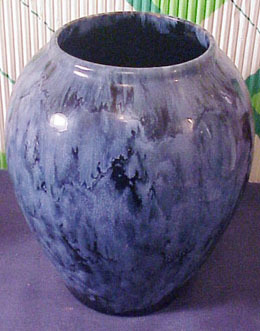 This vase is simular to the Brush McCoy Onyx glaze vase above. But I don't believe it was made by the Brush company because it is different in several ways The glaze is more of a flambe being heavier then the onyx. The bottom of the vase is covered in the black glaze, rather heavily. The rim is thin unlike the flat lip that the Brush pieces have. The glaze drips into the interior, and it has a wider mouth then any of the Brush vases in their onyx line too. There is no markings that I can see. Fulper? It is in very nice condition. No chips, cracks or repairs. There is a small glaze flake on the rim. Normal age crazing to the glaze. 6-1/2" tall and 3" opening. 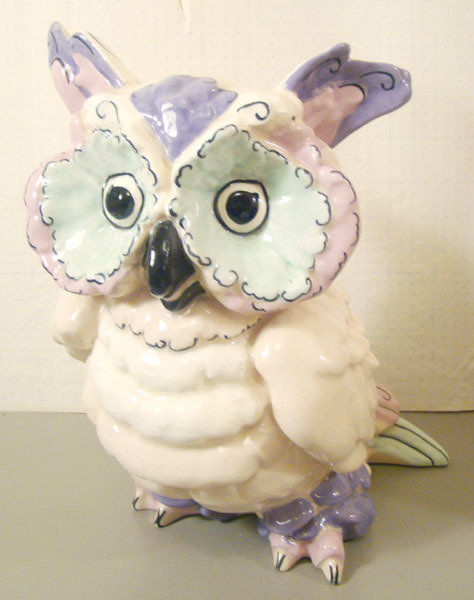 Gorgeous Kay Finch large "Toot" owl figurine. Signed Kay Finch California in ink stamp on the bottom. Kay Finch produced her ceramics in Corona Del Mar, California, back in the years 1935-1963. Figurine is a nice larger size at 8-1/2" tall. Whimsical, hand decorated, pastel glazes. Pink, green, black, and lavender. Uniquely hand decorated by Kay. Glaze flake on one ear edge and a notable chip on the center tail feather. Excellant condition other wise. Displays nicely. Kay's works are highly collectible and this would make a lovely addition to any collection. 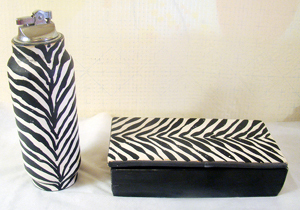 Stunning mid-century lidded box for the coffee table. Blue/green lava accented glaze. 5-3/4" x 4-1/2" x 4-1/4". Excellant condition. Unsiged. Bitossi imported by Raymor? Impressive coffee table ashtray cigarette box combination. 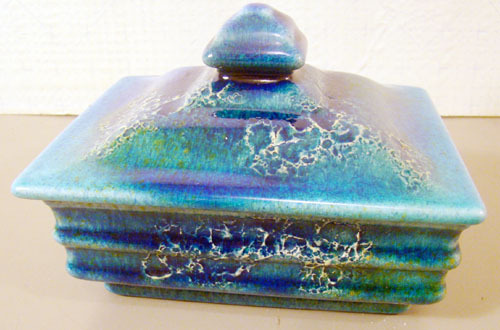 Matches the box listed above with its blue/green lava accented glaze. Wood handle on the cigarette storage box. 12" x 7-3/4" x 3". Excellant condition other then a small chip on the edge of the boxes lid that has been touched up. Unmarked, thinking Bitossi imported by Raymor. This is a wonderful vintage 1950's art pottery horse ashtray by Barbara Willis (1917-2011) . Extremely collectible, highly sought after and very illusive. Featuring a heavy pastel, cutting edge for its time, lite citron crackle glaze. It is 8-1/2" x 6" x 4-1/2". This horse ashtray is in very nice condition overall. Strong lines and sharp details. No breaks, cracks or repairs. It does have a small flake/chip to the glaze on the underside of the tail. Not visible except when its turned over and your looking for it. The bowl area has a couple of lite grayish hue spots from use. Signature on base is almost obscure due to heavy glaze. Unique form and modernist style make this a piece that will fit into any modern style decor or vintage 50's studio art pottery collection. VAN BRIGGLE SGND. GEOMETRIC CUBIST VASE! Signed Anna Van Briggle, Colo Springs, with V ,cross in box mark. Great modern, geometric cubist style. Brown with white frosted drip glaze rim. No chips, chiggers cracks or hairlines. 9-1/4" tall overall. Nice addition to any modern, retro, eames style decor. SUPERB LARGE MULTI COLORED GLAZED POTTERY LEAF DISH! 15-1/4" long and 6-1/2" wide, 2" tall. Amazing glaze inside. Must see to appreciate. So many colors. Back is mostly gold and brown. Some drip colors along the edge. 5 small feet. Marked USA. Maker unknown. Excellant condition. You'll look a long time before finding this caliper oFffine glazing . 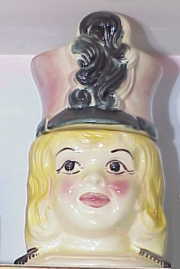 RARE AMERICAN BISQUE MAJORETTE COOKIE JAR! Beautiful old cookie jar. Made by American Bisque. 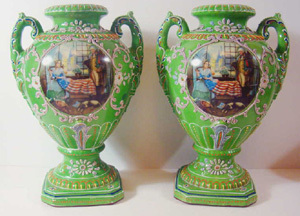 Vivid coloring and more detailed then the simular, more common Regal China jars. 11" tall.. Excellant condition overall. No chip crack or repairs. There is a hairline like split inside the top of the hat lid, from when it was made. This does not hurt the integrety of the jar. Nothing visible on the outside. A stunning old cookie jar to add to any collection. or it would make a nice unique gift! 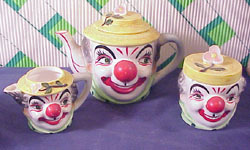 RARE PY CLOWN TEAPOT, SUGAR & CREAMER! 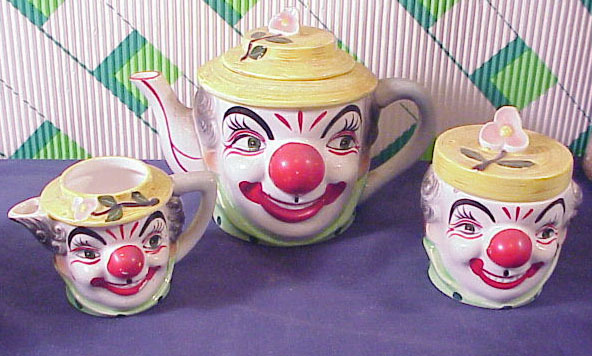 Wonderful vintage teapot set. Produced in the 1950's by PY, of Japan, and pieces are marked on the bottom. Its a happy clown family. The teapot is 6" tall 9" wide, the sugar 3-1/2 and the lidded creamer 5-1/4". Cold paint and paint under glaze give this set a unique look. No chips, cracks or hairlines other then a chip on the teapot's lid, flower pedal, and a small chigger on the side of the sugar base. Lite wear to the cold paint. This set is a delicate thin porcelain and its hard to believe it has survived as well as it has. Its an extremely hard to find set with each piece being very illusive. 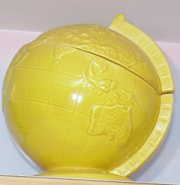 RARE WORLD GLOBE "Doranne of California" 1950's COOKIE JAR! Excellant condition on this hard to find vintage cookie jar. 11" tall. Marked j-19 on the bottom side. Produced by Doranne of California. No chips. cracks, hairlines or repairs. A nice addition to any collection. Great gift for anyone who loves to travel! Royal Haeger EARTHWRAP Vase Eames Era! This is a wonderful 1940's vase by the talented artist and sculptor Royal Arden Hickman. It was superbly executed , and displays the Earthwrap glaze brilliantly. Green, Orange, and Brown. It stands 8-1/8" tall, and 4-1/8" across the top. It is in very nice condition, no chips, chiggers, hairlinesor repairs. Glaze has some lite crazing as expected from aging. The bottom is signed Royal Haeger U.S.A. This is truely a stunning vase to display in any collection, or add to any mod , Wormley, Eames, Panton, Herman Miller decor. 50's Mary Mary Nursery Rhyme Planter ! 5"x 5", Original 1950's planter Mary Mary Quite contrary, nursery rhyme planter. No chips, or cracks. Some normal crazing.Very nice!